The White House official 2018 budget titled, “A New Foundation for American Greatness” reads more like a new plan to kill the American dream for working families. It includes some of the steepest budget cuts the country has ever seen. Who are the victims of these cuts? The poor, the environment, and our children will be the most affected. Let’s dig into the numbers. Trump’s budget cuts the food stamp program, CHIP, which provides health insurance to children. It would also cut social security disability insurance by 72 billion and Medicaid would see up to 610 billion in cuts. (This is on top of the 880 billion in cuts that are in the republican health care plan.) In total the budget would cut Medicaid’s funding in half. But wait… didn’t Trump endlessly promise to not cut social security and Medicaid during the election? Trump’s budget also targets college students by making college less affordable, especially for those who come from low-income families. Trump’s plan looks to slash grants from 1.6 million students, makes $732 million in cuts from tuition assistance for low-income students, terminates $700 million in Perkins Grants, and takes $3.9 billion from the Pell Grant program. In addition, career and technical education would be cut by $196 million. These reductions are an assault on the dream of many parents and children who want a brighter future. Federal Employees will also be feeling the burn of Trumps budget. The budget proposes cutting $117 billion from federal employees and retirees on top of $182 billion that has been taken from workers since the start of the decade. It also eliminates the Public Service Loan Forgiveness program that many rely on to relive their high student debt burdens. But how would this budget directly affect Floridians? While the recently released budget is more of a broad look at the president’s fiscal plans and not a detailed line item look, here are some things to look for. Unsurprisingly the budget looks to cut the EPAs Superfund programs and funding to global warming research. These cuts should be worrisome to Floridians as Florida is home to two cities of 20 major cities in the world (yes, the world) who are most vulnerable to rising sea levels. $670 million in FEMA cuts put us in danger during our unpredictable hurricane seasons. With all this talk of cuts and losses, are there any gains? Well let’s take a look at the lucky few who are looking at a win with this budget. The defense department would see a budget increase of $54 billion, most of which would go to production of weapons and equipment. Oil and gas companies are looking at a big win as the budget proposes to sell off half of the US oil reserve and allows drilling in the arctic national wildlife refuge. With the cuts proposed to EPA’s budget, major companies can continue to pollute and put our environment at risk with less oversight. Corporations will also score a big win with a proposed reduction of the corporate tax rate to 15%, a handout that could reduce revenue for vital public programs by nearly $2.4 trillion in the first decade. Simply put, the budget is a bad deal for America’s workers. 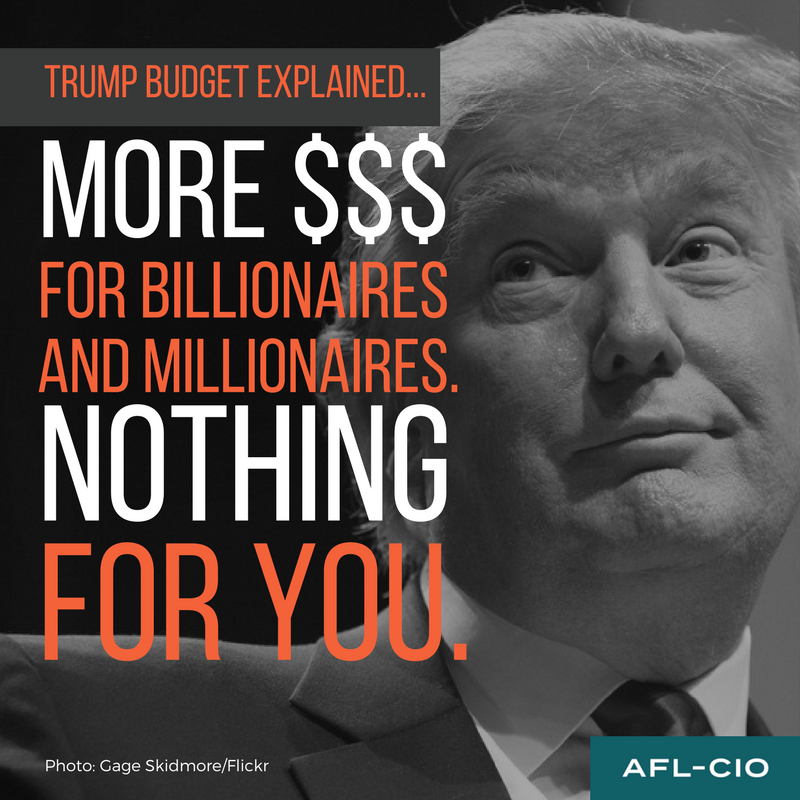 With cuts of 1.7 trillion out of the social safety net and a potential loss of nearly 2 million jobs by 2020, the deal-maker-in-chief has dealt what’s best for working people right out of his budget.